With the Blizzard of 2010 back east and the torrential downpours we’ve had on the left coast, a soup for each day of the week is the perfect antidote for the chill of winter. I’ve been stirring up comforting, steamy bowls of chicken noodle, chili, minestrone, and Tuscan bean. Perfect for quick weekday dinners or casual entertaining; soups are economical, simple to make, and usually require only one pot and a little bit of chopping and stirring. 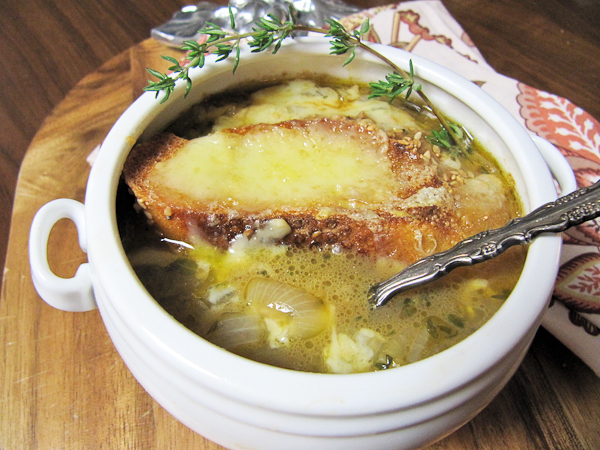 Two blogs that I regularly read are the inspiration behind this French Onion Soup. First, I saw the recipe on An Edible Mosaic where Faith surprises and pleases her readers with “everyday fare with extraordinary flair” and, second, it was serendipity that I had a block of French Comté cheese and David Lebovitz, cookbook author, professional baker of 35 years and rock star among food bloggers, recently wrote about his visits to the Comté fruitières, where the cheese making begins, and the cave de affinages, the cavernous cellars where the cheese ripens. David combines a photo journalistic approach and wry humor to inform readers about his adventures eating and living as an American in Paris. Anyone with an interest in food, particularly, French food, would find his posts interesting and educational, but because I’m able to travel with The Don to Paris now and then, I often refer to David’s posts to guide me in my fledgling explorations. 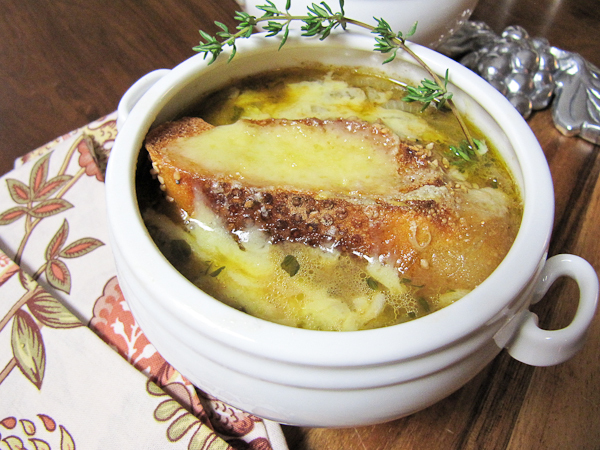 Classic French onion soup topped with a crusty baguette slice and France's favorite cheese takes the chill out of winter. Thinly slice onions into rings or half rings. In a medium-sized heavy saucepan, heat the olive oil over medium-high heat until the oil starts to ripple. Sprinkle with red pepper flakes. Add the onion, thyme and salt. Stir to coat the onions with oil. Cook, stirring occasionally, for about 10 minutes until the onion starts to soften and turn golden. Lower the heat to medium-low and cook the onions for 15 to 20 minutes, stirring occasionally, until they are a rich caramel color. If the onions begin to stick to the bottom of the pan, add a splash of water. Add the beef stock and bay leaf and use a wooden spoon to scrape up any brown bits on the bottom of the pan. Let the soup simmer for about 15 minutes. Add salt and pepper to taste. Preheat the broiler. Broil the bread on both sides until it’s lightly browned. Watch closely – I can’t tell you how many times I’ve burnt the first batch! Place the bowls on a rimmed cookie sheet. Ladle the soup into bowls, top with a crouton and sprinkle with grated cheese. Broil until the cheese is melted. bubbling and beginning to brown. This takes only a minute, so watch closely! *Buy a good quality beef stock, if you don't make your own. Quality ingredients are the difference between delicious and not so much. I have substituted vegetable broth to make this vegetarian without any sacrifice in flavor. French onion soup is definitely one of my favorites! And I just got the perfect bowls for Christmas to serve this in! This is definitely in my near future! Welcome home! It must be nice to get out of that snow. French onion is hands down, my favorite soup. In the past I’ve left restaurants that didn’t have any on the menu in search of one that did. This one looks lovely! I love how that cheese is perfectly melted atop that bread crouton. Yum! I am heading back up to mammoth tomorrow for NYE… I will definitely be hunting down some french onion soup while I’m there. Oh Priscilla that sounds perfect for this cold weather. Lovely recipe and looks so good! So true – quality ingredients always make the dish delish! A bowl of this is just what I need to tackle this cold – thank you for sharing! Wonderful weather for this dish…looks yummy. I have never had a french onion soup but have always wanted to try one. My boyfriend hates onions though, so this would be great for a night when he is out of town. Looks beautiful! I love soups during the winter season…I actually just had corn chowder (chowdah) for lunch. I love the french onion soup, I wasn’t a fan of it until I got older and now I can’t seem to get enough of it! I hope you had a great Christmas! Good looking soup but I’m all about that bread you added on top. What a way to dress up a winter dish! Hope your surgery goes well and recovery is speedy! 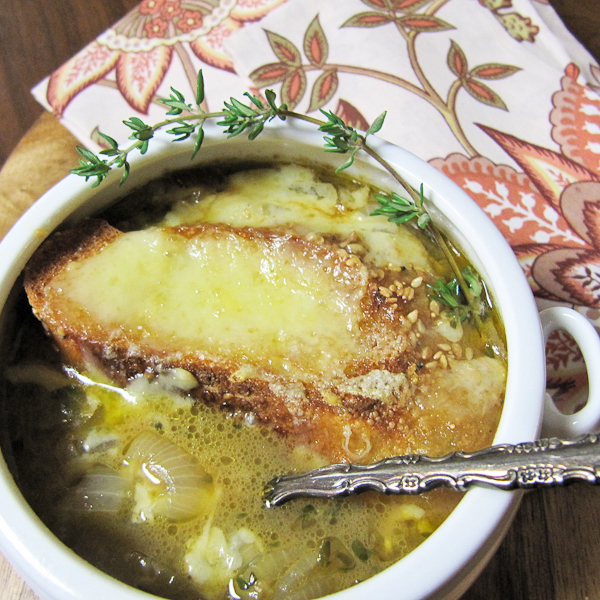 I love French Onion soup…when done right. I so agree with you about using quality stock. Yours looks spot on. You already got me at the Onion soup part…then you added Comte’ cheese and I could not stop staring at that soup. Soooo needed in these rainy days. I’m sure I can eat a few bowls of this in this freezing weather. Would be so comforting 🙂 Beautiful pictures! Thanks very much for sharing. Happy Holidays! oh man…does that soup look yummy and totally got me at some quality French onion soup! Well well done! That is a delicious-looking soup! The cheese on top … yeah, that’s a bit of heaven. Perfect and delicious for a rainy day like today! I saw DL’s post on comte, too. Now I’m intrigued by the idea and have comte on my market list. 🙂 Our go-to French Onion Soup (last made for Christmas Eve dinner) incorporates Cognac, flamed at the table (one of Mr. RGBistro’s party tricks). Thanks for all the great comments! Today, is a perfect day for soup wherever you are! Having just finished a rather uninspired bowl of chicken and wild rice soup (gift from a friend) I am feeling really envious – this is, hands down one of my all time favorite soups!!! Comte is on my list and when I get my hands on some, this will be the first thing I make!! Thanks so much for your sweet words, Priscilla! I’m so glad you liked the soup — I hope it took off a bit of winter’s chill. Love the idea of using Comte, I’ll definitely be trying that! What a gorgeous presentation of my forever favorite soup…I do a veggie version, but still all the same my favorite. Faith does have a way with warm and comforting foods, as well as do you. Beautiful! I have never tried comte cheese…but now I’m hankering to buy some. I will have to make this when I get back to Austin. We have a wonderful artisan cheese house nearby our apartment…I’m sure I can find it there. Thank you for sharing with me, my friend. I wish you and your family a happy and blessed new year! This is one of my all time favorite soups, and you have recreated it here to perfection! The Comté on the French baguette crouton looks amazing!